I'm now a Research Scientist in Fraunhofer Institute for Intelligent Analysis and Information Systems (Fraunhofer IAIS), working with Dr. Gennady Andrienko and Dr. Nathaliyia Andrienko in Germany. I'm also a Postdoctoral Researcher in University of Bonn, working with Prof. Stefan Wrobel. I received my Ph.D. on Computer Science at EECS, Peking University under my supervisor Prof. Xiaoru Yuan. My research interests are in general visualization and visual analytics techniques. My special focuses are spatial temporal visualization, social network visual analytics and security visual analytics. I like computers, travelling and poems. I believe information can be spread widely through visual communication. Sep 2007 - 2011, Fudan University (Graduated with Honors), Shanghai, PRC, BS on Information Security, School of Computer Science and Technology, minor in World Economy and Trade, School of Economics. Siming Chen, Natalia Andrienko, Gennady Andrienko, Linara Adilova, Jeremie Barlet, Joerg Kindermann, Phong.H Nguyen, Olivier Thonnard, Cagatay Turkay. LDA Ensembles for Interactive Exploration and Categorization of Behaviors. Siming Chen, Jie Li, Gennady Andrienko, Natalia Andrienko, Yun Wang, Phong.H Nguyen, Cagatay Turkay. 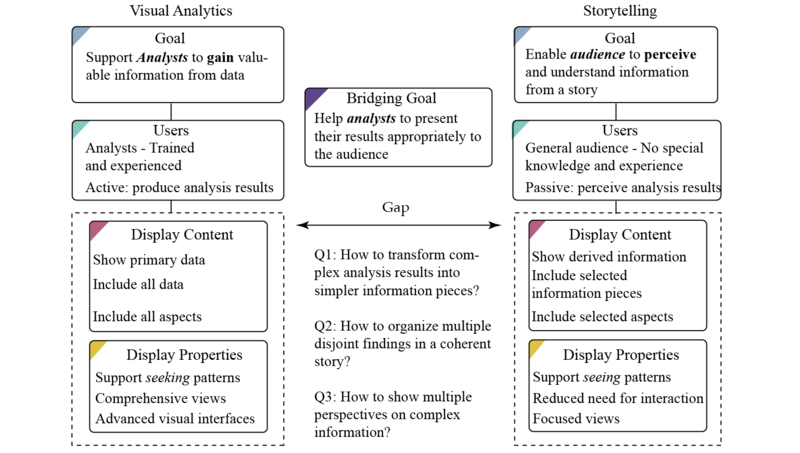 Supporting Story Synthesis: Bridging the Gap between Visual Analytics and Storytelling. Semantics-Space-Time Cube. A Conceptual Framework for Systematic Analysis of Texts in Space and Time. Siming Chen, Shuai Chen, Zhenhuang Wang, Jie Liang, Yadong Wu, Xiaoru Yuan. D-Map+: Interactive Visual Analysis and Exploration of Ego-centric and Event-centric Information Diffusion Patterns in Social Media. ACM Transactions on Intelligent Systems and Technology (TIST), 10(1), 11, 2018. COPE: Interactive Exploration of Co-occurrence Patterns in Spatial Time Series. IEEE Transactions on Visualization and Computer Graphics (TVCG), 2018, Accepted. User Behavior Map: Visual Exploration for Cyber Security Session Data. in Proceedings of 2018 IEEE Symposium on Visualization for Cyber Security (VizSec'18) , Berlin, Germany, Oct.22, 2018. Visual Exploration of Spatial and Temporal Variations of Tweet Topic Popularity. in Proceedings of EuroVis Workshop on Visual Analytics (EuroVA'18) (Best Paper Award), Brno, Czech Republic, Jun.4-8, 2018. Alexandra Diehl, Michael Hundt, Johannes Häußler, Daniel Seebacher, Siming Chen, Nida Cilasun, Daniel Keim and Tobias Schreck. SocialOcean: Visual Analysis and Characterization of Social Media Bubbles. in Proceedings of 2018 International Symposium on Big Data Visual and Immersive Analytics (BDVA'18) , Konstanz, Germany, Oct.17-19, 2018. Alexandra Diehl, Bin Yang, Rahul Deb Das, Siming Chen, Gennady Andrienko, Natalia Andrienko, Doris Dransch and Daniel Keim. 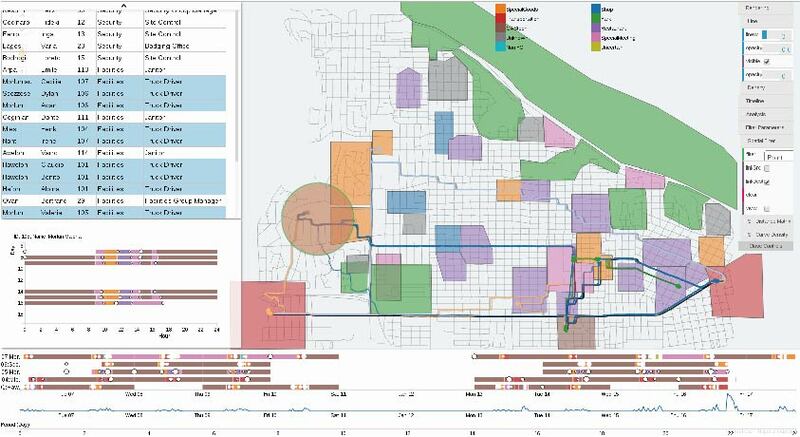 User Uncertainty: A Human-Centred Uncertainty Taxonomy for Volunteer Geographic Information through the Visual Analytics Workflow. in Proceedings of VGI Geovisual Analytics Workshop 2018, Konstanz, Germany, Oct.19, 2018. Siming Chen, Zuchao Wang, Jie Liang, Xiaoru Yuan. Uncertainty-aware Visual Analytics for Exploring Human Behaviors from Heterogeneous Spatial Temporal Data. Journal of Visual Languages and Computing (ChinaVis'16, Honorable mention for Best Paper Award), 2018, Accepted. Siming Chen, Shuai Chen, Lijing Lin, Xiaoru Yuan, Jie Liang, Xiaolong (Luke) Zhang. 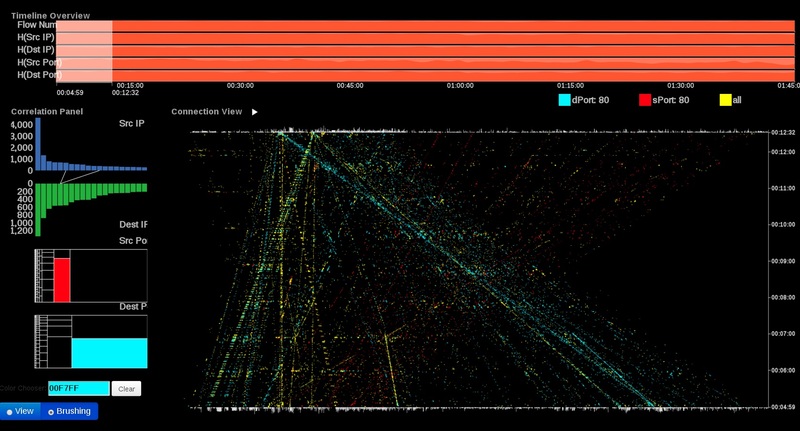 E-Map: A Visual Analytics Approach for Exploring Significant Event Evolutions in Social Media. in Proceedings of IEEE Symposium on Visual Analytics Science and Technology (VAST'17), Phoenix, USA, Oct.1-6, 2017. Siming Chen, Lijing Lin, Xiaoru Yuan. Computer Graphics Forum (EuroVis State-of-the-Art Report'17), 36(3): 563-587, 2017. 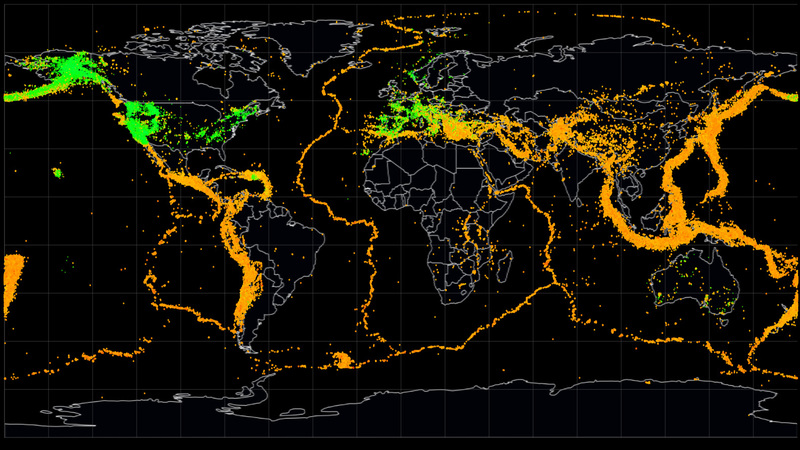 Visual Exploration of Ionosphere Disturbances for Earthquake Research. In Proceedings of SIGGRAPH Asia '17 Symposium of Visualization (Honorable Mention for Best Paper Award), Bangkok, Thailand, Nov. 27-30, 2017. Frontier of Information Visualization and Visual Analytics in 2016. Journal of Visualization, 20(4):667–686, 2017. Interaction+: Interaction Enhancement for Web-based Visualizations. In Proceedings of IEEE Pacific Visualization Symposium (PacificVis 2017), pages 61-70, Seoul, Korea, Apr.17-20, 2017. Visual Analysis for Microblog Topic Modeling. Siming Chen, Shuai Chen, Zhenhuang Wang, Jie Liang, Xiaoru Yuan, Nan Cao, Yadong Wu. 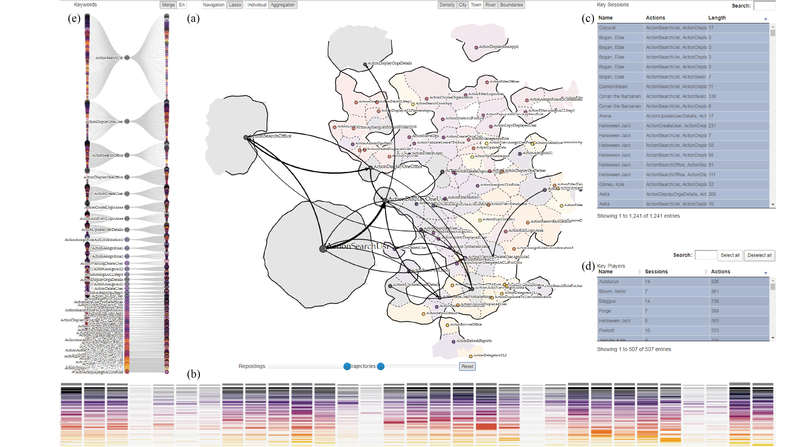 D-Map: Visual Analysis of Ego-centric Information Diffusion Patterns in Social Media. in Proceedings of IEEE Symposium on Visual Analytics Science and Technology (VAST'16), pages 41-50, Baltimore, USA, Oct. 23-28, 2016. Visualization of Social Media Flows with Interactively Identified Key Players. in Proceedings of the Third Conference of China Visualization and Visual Analytics (ChinaVis'16), Changsha, China, Jul.21-23, 2016. Siming Chen, Xiaoru Yuan, Zhenhuang Wang, Cong Guo, Jie Liang, Zuchao Wang, Xiaolong (Luke) Zhang and Jiawan Zhang. Interactive Visual Discovering of Movement Patterns from Sparsely Sampled Geo-tagged Social Media Data. IEEE Transactions on Visualization and Computer Graphics (VAST'15), 22(1): 270-279,2016. Min Lu, Zuchao Wang, Xiaoru Yuan, Siming Chen, Tangzhi Ye. 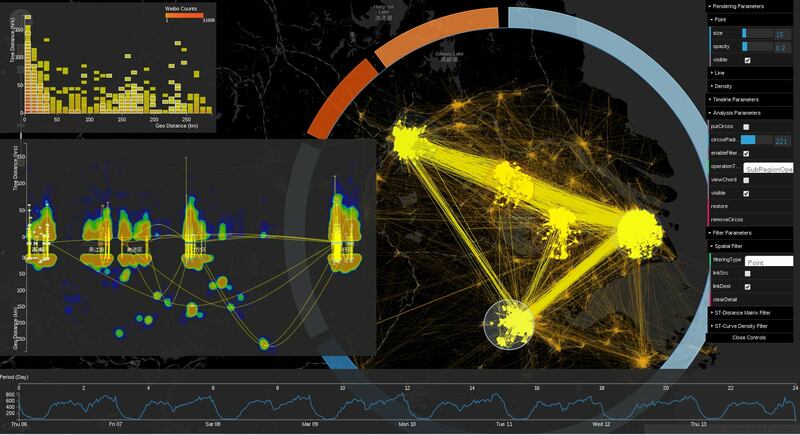 Visual Exploration of Urban Data. Siming Chen, Cong Guo, Xiaoru Yuan, Fabian Merkle, Hanna Schaefer and Thomas Ertl. OCEANS: online collaborative explorative analysis on network security. in Proceedings of the Eleventh Workshop on Visualization for Cyber Security (VizSec'14), Pages 1-8, Paris, France, Nov.10, 2014. Siming Chen, Jie Li, Gennady Andrienko, Natalia Andrienko, Phong H. Nguyen, Cagatay Turkay. Bridging the Gap between Visual Analytics and Storytelling: General Framework and Application to Social Media Data. Siming Chen, Jie Li, Natalia Andrienko and Gennady Andrienko. TopicWave: Interactive Visual Analytics of Spatiotemporal Topics Distribution of People’s Reactions to Events from Geo-tagged Social Media. Phong H. Nguyen, Siming Chen, Natalia Andrienko, Michael Kamp, Linara Adilova, Gennady Andrienko, Olivier Thonnard, Alysson Bessani, Cagatay Turkay. Designing Visualisation Enhancements for SIEM Systems. in Proceedings of 2018 IEEE Symposium on Visualization for Cyber Security (VizSec'18) . Phong H. Nguyen, Siming Chen, Natalia Andrienko, Gennady Andrienko, Olivier Thonnard, Cagatay Turkay. Doing User Behaviour Analytics through Interactive Visual User Profiles. Qiusheng Li, Qi Ma, Xinyue Luan, Xin Huang, Zhuo Zhang, Kui Yang, Yin Zhao, Siming Chen. An Open Data Source of Internal Threat Information inside a Company. 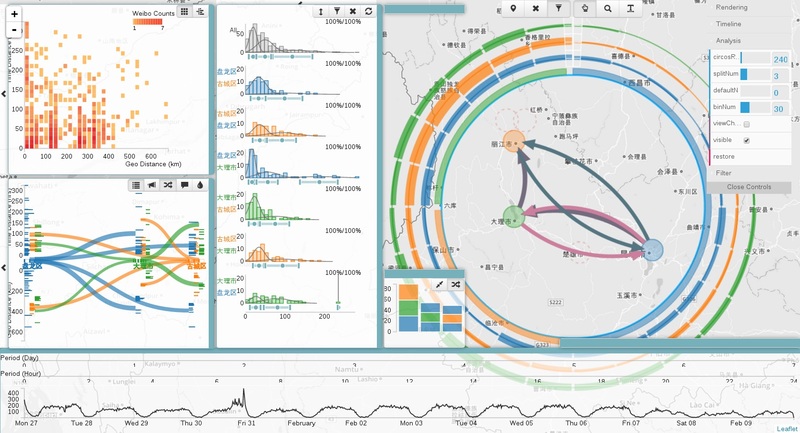 in Proceedings of the Fifth Conference of China Visualization and Visual Analytics (ChinaVis'18) , in Chinese, Honorable Mention Award for Best Poster. Lijing Lin, Siming Chen, Fan Hong, Chufan Lai, Shuai Chen, Xiaoru Yuan. 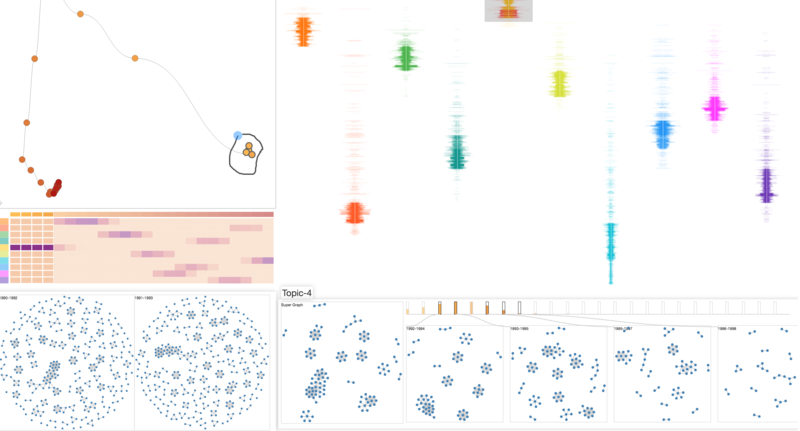 GraphLDA: Latent Dirichlet Allocation-based Visual Exploration of Dynamic Graphs. Zhibang Jiang, Siming Chen, Shuai Chen, Yumiao Sun, and Xiaoru Yuan. Ferment and Counter Revolution: A Visual Storytelling for "Gauze Event" in Social Media. Guozheng Li, Yu Zhang, Siming Chen, Haocheng Zhang, Jie Liang, Xiaoju Dong, Jinsong Wang, Xiaoru Yuan. 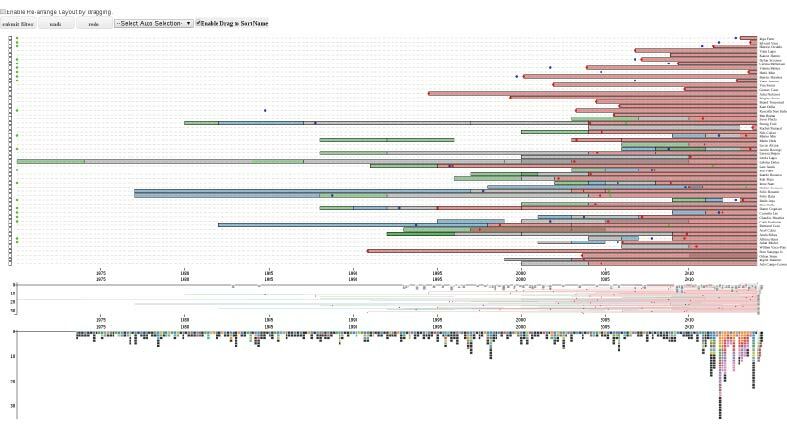 SignalTreeExplorer: A Multi-Tree Comparison System for Visually Exploring Time Sequential Communication Data. Siming Chen, Zhenhuang Wang, Jie Liang, Xiaoru Yuan. 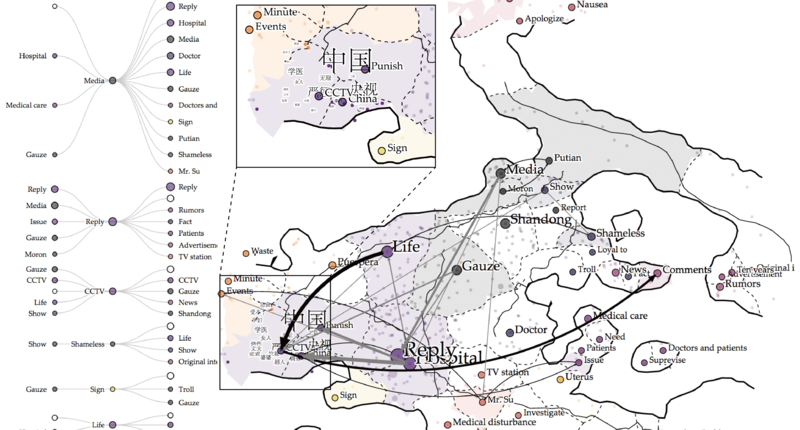 Weibo Footprint: A Web-based Visualization System to Analyzing Spatial-temporal Movement of Geo-tagged Social Media Users. Yining Nie, Siming Chen, Xiaoru Yuan, Zhimin Huang, Ka-Wai Chan. 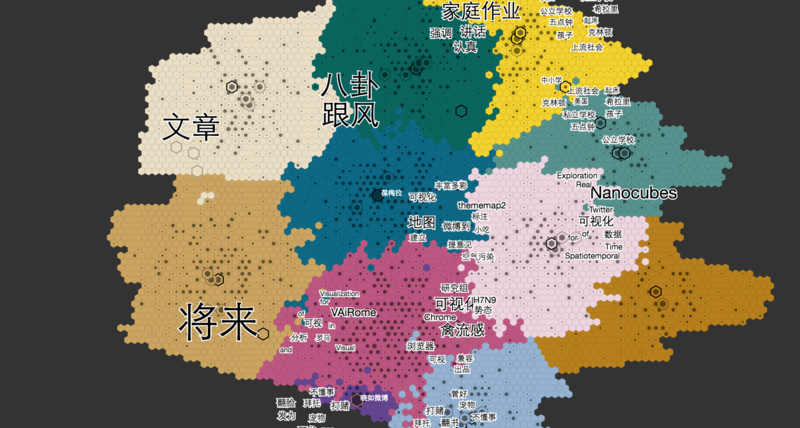 China’s Property Market Visual Report: An Interactive Web-based Narrative Visualization for Data Journalism. Min Lu, Jie Liang, Zongru Li, Siming Chen, Xiaoru Yuan. In Proceedings of the third Conference on China Visualization and Visual Analytics, 2016. Best Poster Award. Siming Chen, Zuchao Wang, Xiaoru Yuan. Behavior Visual Analysis Supporting Spatial/temporal Data with Uncertainty. In Proceedings of IEEE Pacific Visualization Symposium (PacificVis 2015). Interactive Visual Classification and Analysis on Network Activity. Zuchao Wang, Xiaoru Yuan, Tangzhi Ye, Youfeng Hao, Siming Chen, Jie Liang, Qiusheng Li, Haiyang Wang, Yadong Wu. Visual data quality analysis for taxi GPS data. In Proceedings of IEEE Symposium on Visual Analytics Science and Technology (IEEE VAST), 2015 Honorable Mention for Best Poster Award. Xiaoru Yuan, Xin Zhang, Zhenhuang Wang, Cong Guo, Siming Chen, Donghao Ren, Jie Liang. A Hybrid Approach to Support Microblog-based Geo-Visual Analytics. Siming Chen, Cong Guo, Xiaoru Yuan, Jiawan Zhang, Xiaolong(Luke) Zhang. 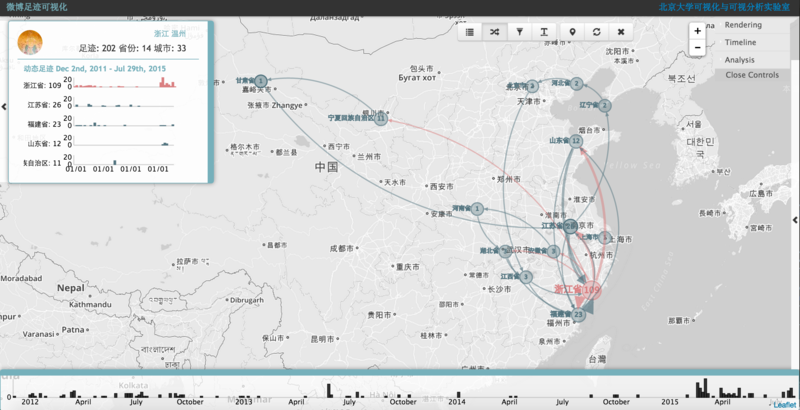 MovementFinder: Visual Analytics of Origin-Destination Patterns from Geo-tagged Social Media. In Proceedings of IEEE Symposium on Visual Analytics Science and Technology (VAST). Siming Chen, Chenglong Wang, Zipeng Liu, Zhenhuang Wang, Zuchao Wang, Zhengjie Miao, Xiaoru Yuan. Visual analytics support for collecting and correlating evidence for intelligence analysis. Fan Hong, Siming Chen, Hanqi Guo, Xiaoru Yuan, Jian Huang, Yongxian Zhang. Visual Analysis of Ionospheric Disturbance Hypotheses about Earthquake. In Proceedings of IEEE Symposium on Scientific Visualization (SciVis). Siming Chen, Zhenhuang Wang, Qingya Shu, Xiaoru Yuan. Beijing Design Week, GeoCity Smart City-International Information Design Exhibition, Beijing, China, 2013. September 26 - Octobor 13, 2013 (Design Exhibition). Best PhD Thesis Award, Beijing Society of Image and Graphics (GSIG), 2018. 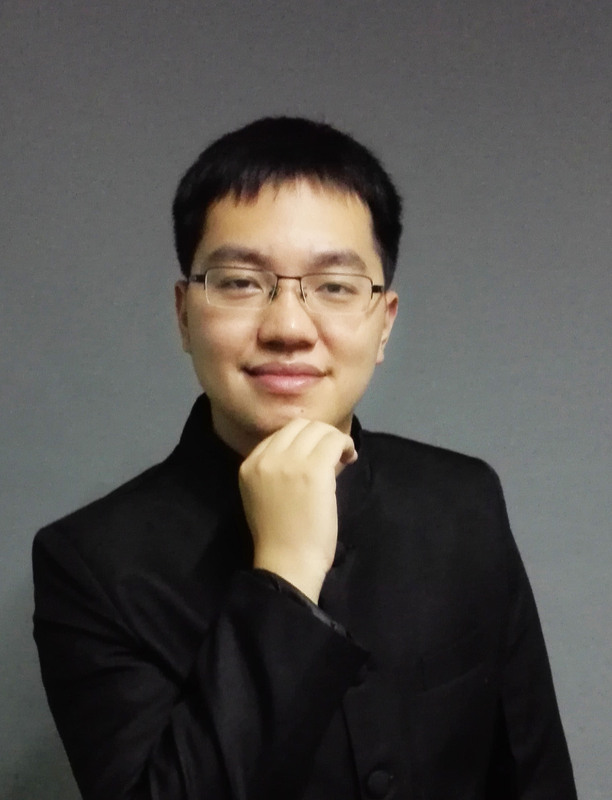 Top Ten Students with Academic Research Honor, EECS, Peking University, 2017. Yu Zhang, Guozheng Li, Chufan Lai, Qiangqiang Liu, Shuai Chen, Lu Feng, Tangzhi Ye, Siming Chen, Ren Zuo, Zhuo Zhang, Zhanyi Wang, Xin Huang, Fengchao Xu, Li Yu, Shunlong Zhang, Qiusheng Li, Xiaoru Yuan. STAD-HD: Spatial Temporal Anomaly Detection for Heterogeneous Data through Visual Analytics. In Proceedings of IEEE Symposium on Visual Analytics Science and Technology (VAST Challenge), Outstanding Comprehensive Solution Award, 2016. Tangzhi Ye, Youfeng Hao, Zhenhuang Wang, Chufan Lai, Siming Chen, Zongru Li, Jie Liang and Xiaoru Yuan. Behavior analysis through collaborative visual exploration on trajectory data In Proceedings of IEEE Symposium on Visual Analytics Science and Technology (VAST Challenge), Honorable Mention for Good Support for Flexible and Collaborative Analysis, 2015. Siming Chen, Zuchao Wang, Zipeng Liu, Zhenhuang Wang, Chenglong Wang, Zhengjie Miao and Xiaoru Yuan. MovementFinder: Multiple filters for spatial temporal visual analytics. In Proceedings of IEEE Symposium on Visual Analytics Science and Technology (VAST Challenge), Award for Excellent Comprehensive Visual Analysis System, 2014. Chenglong Wang, Siming Chen, Zhengjie Miao and Xiaoru Yuan. 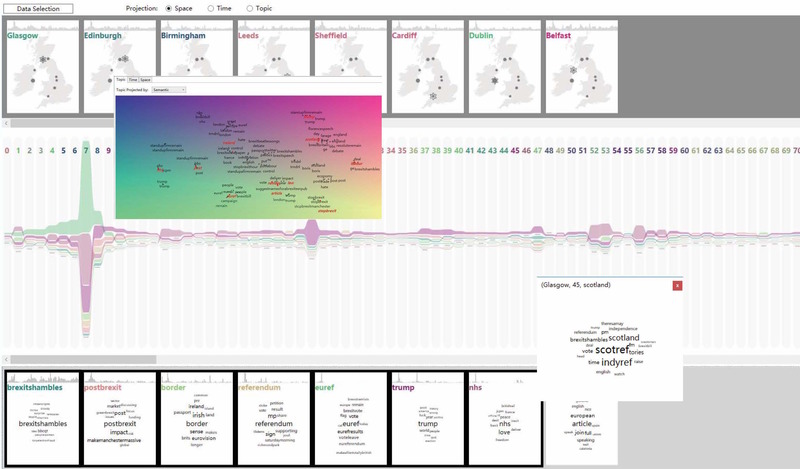 Story Explorer: A Visual Analysis Tool for Heterogeneous Text Data. In Proceedings of IEEE Symposium on Visual Analytics Science and Technology (VAST Challenge), Award for Excellent Detailed Analysis, 2014. Zipeng Liu, Zhenhuang Wang, Siming Chen, Zuchao Wang, Zhengjie Miao and Xiaoru Yuan. A Platform For Collaborative Visual Analysis on Streaming Messages. In Proceedings of IEEE Symposium on Visual Analytics Science and Technology (VAST Challenge), Award for Excellent Collaborative Streaming Analysis, 2014. Siming Chen, Fabian Merkle, Hanna Schafer, Hongwei Ai, Cong Guo, Xiaoru Yuan and Thomas Ertl. 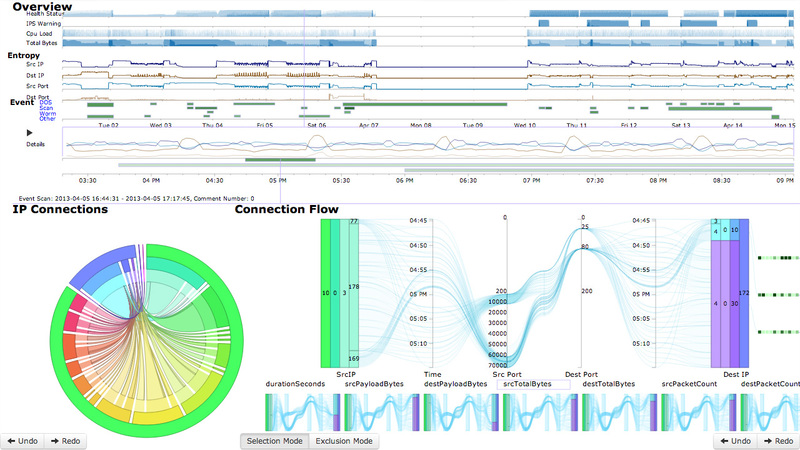 AnNetTe - Visual Analytics for Network Security Data. In Proceedings of IEEE Symposium on Visual Analytics Science and Technology (VAST Challenge), Award of Outstanding Situation Awareness, 2013. Analysts can submit the findings and organize them in the multi-facet layout. 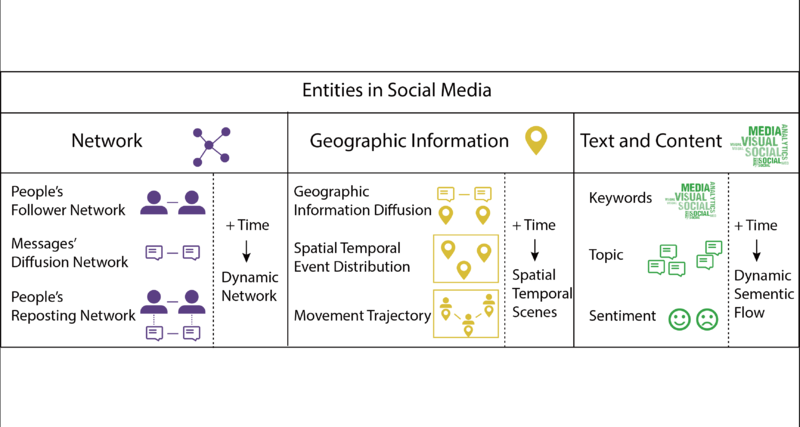 Propose a general framework for visual analytics of spatial temporal data with semantic information. Construct the semantic map for user behaviors to identify patterns and detect outliers. Propose a general information visual analytics framework for both ego-centric and event-centric analysis. Investigate the spatial temporal and semantic patterns in social media to understand the reactions. Summarize the uncertainty and propose the possible solution to reduce it in visual analytics. Project the multi-faceted and complex features in social event onto a semantic, structured and explorable map. Provide visualization and visual analytics taxonomies for advanced social media visual analytics. Analyze the evolution of dynamic graph based on mining methods with the visual analytics approach. Crowd participating visualization system, making every social media users reflecting and analyzing his trajectories. 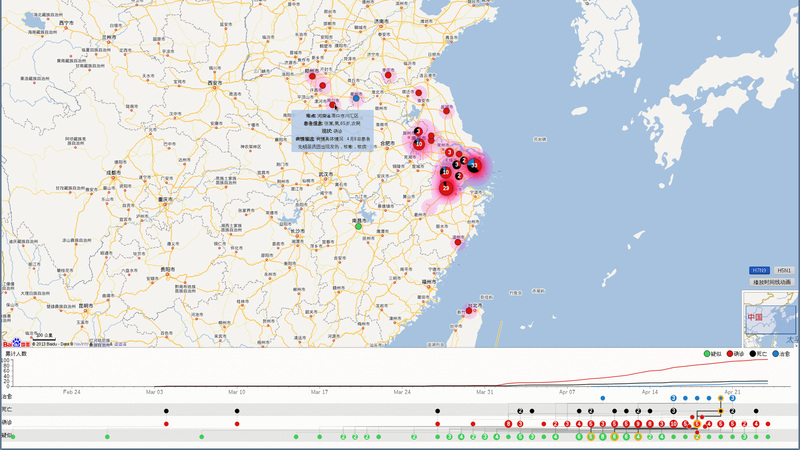 Provide visualization system and case studies of Ludian/Yaan to support analyzing earthquake catalog with geo-tagged social media and help information. Provide a map-based metaphor for constructing the ego-centric social network, analyzing the information diffusion patterns among communities. Considering the uncertainty caused by the sparsely sampled geo-tagged data, derive reliable movement pattern with semantics. 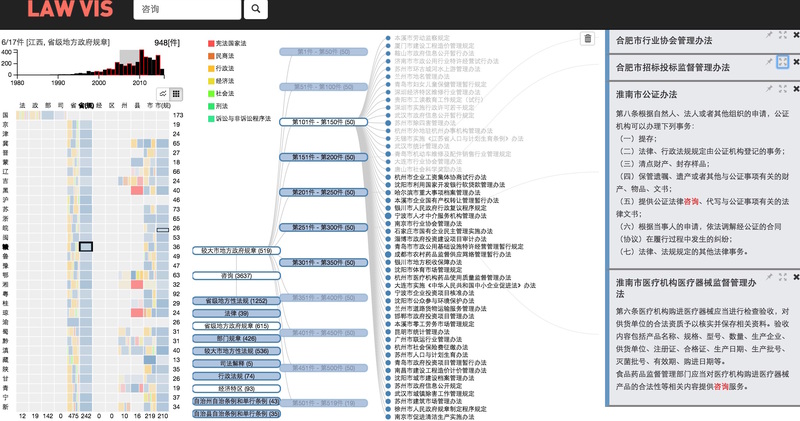 Provide LawVis system to visualize the searching result of Chinese laws, enabling lawyer for better navigating and analyzing the laws in multiple aspects. Provide an online visual analytics system to analyze the dynamic NetFlow data, to classify the network and detect abnormal events . Provide MovementFinder system to solve the challenge of spatial temporal event detection from IEEE VAST Challenge 2014, Mini Challenge 2. Provide Story Explorer system to solve the challenge of news, email and entity relationship analysis from IEEE VAST Challenge 2014, Mini Challenge 1. 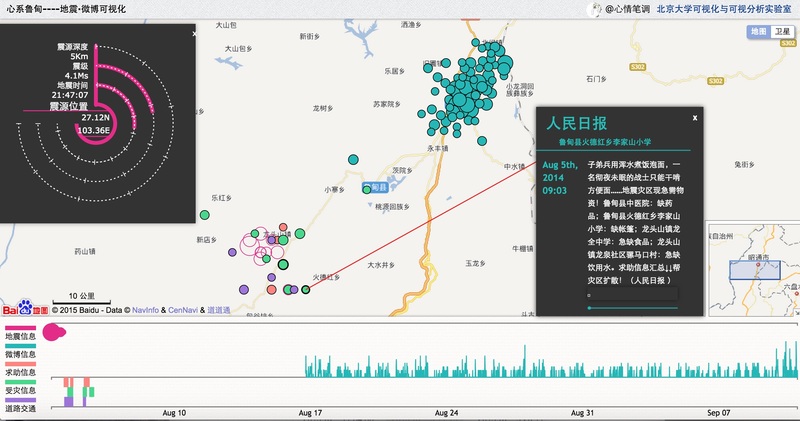 Provide an online visual analytics system to analyze the spatial, temporal and text information based on geo-tagged Sina Weibo data . Visualization of spatial temporal events of Avianflu in China, providing understanding of the avian flu evolution. Provide query-based system to illustrate the relationship between earthquake events and ionospheric disturbance. Transactions on Intelligent Transportation Systems (T-ITS), IEEE, 2018 - 2019. Transactions on Intelligent Systems and Technology (TIST), ACM, 2017 - 2019. Transactions on Interactive Intelligent Systems (TiiS), ACM, 2017 - 2019.
International Journal of Geographical Information Science, Taylor＆Francis, 2018 - 2019.
International Journal of Location-based Services, Taylor＆Francis, 2019. Computer Graphics and Applications (CG&A), IEEE, 2017. Journal of Visualization, Springer, 2016-2018. Journal of Visual Language and Computing (JVLC), Elsevier, 2016 - 2018. 2016, Volunteer of IEEE VIS (VAST, InfoVis, SciVis), Baltimore, USA. 2015, Volunteer of IEEE VIS (VAST, InfoVis, SciVis), Chicago, USA. 2014, Volunteer of IEEE VIS (VAST, InfoVis, SciVis), Paris, France. 2014, Volunteer of 1st Conference of China Visual Analytics (ChinaVA), Beijing, China. 2013, Volunteer of World Geospatial Developers Conference (WGDC), Beijing, China. 2012, Volunteer of China Interaction Design Experience Day (IXDC), Beijing, China. 2011, Volunteer of the Seventh Joint Workshop on Machine Perception and Robotics (MPR), Beijing, China. 2010, Leader volunteer of Shanghai EXPO 2010, Shanghai, China. 2010, Second Runner-up team of Fudan University - University College Dublin “iShamrock Software Competition 2010”. 2010, Social activity award by Fudan University of "Investigation of of Economic Storm" project, Chongqing, China. 2008 - 2009, Vice-president of Club of Poetry, Fudan University, Shanghai, China.